You must be an admin on a project or component in order to change the privacy settings. If you're an admin, you can make your project private or public and alternate between the two settings. You can have different privacy settings on your project and components, thus controlling which parts of your overall project are public or private. 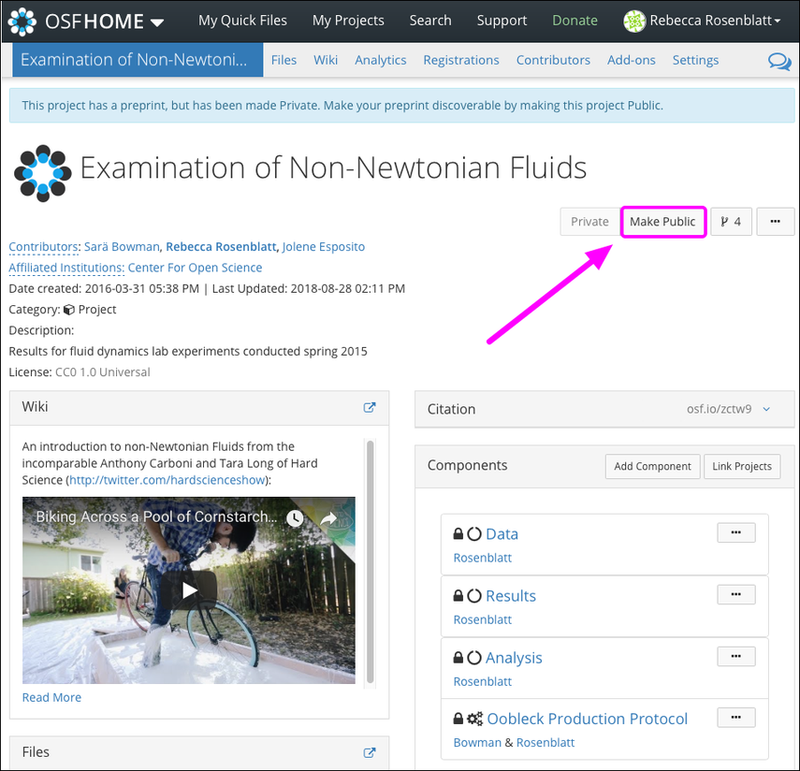 This help guide walks you through how to make all or parts of your project public or private. You can tell if your project or component is public or private by seeing which of the Private or Public buttons is toggled on or off in the top right of the "Project Overview" or "Component Overview" page. 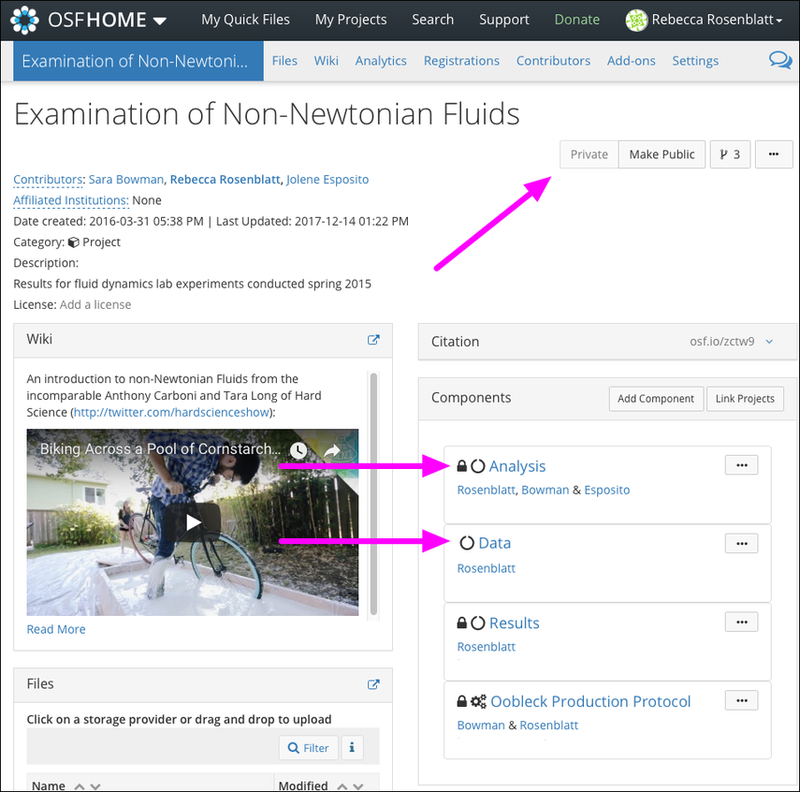 You can quickly tell if your components are public or private from your "Project Overview" page. In the "Components" section, look for a lock symbol to the left of the component name. If the component has a lock symbol next to it, it is private. If the component does not have a lock symbol, it is public. Projects and components are private by default. To make your project and/or component(s) public, click the Make Public toggle button in the top right of the "Project Overview" or "Component Overview" page. 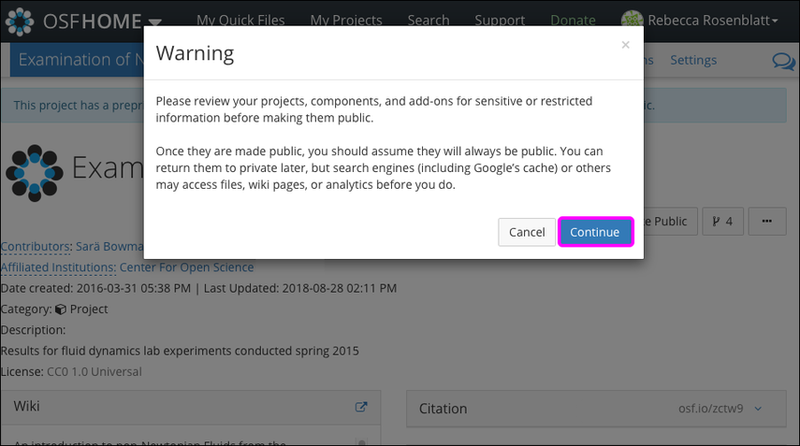 A modal will appear, asking you to check your data for sensitive information before making your project and/or components public. After you have reviewed your data, click Continue. If you have components, a second modal will appear from which you can select which components (if any) you want to make public. Only admins on the components can select components from this modal. 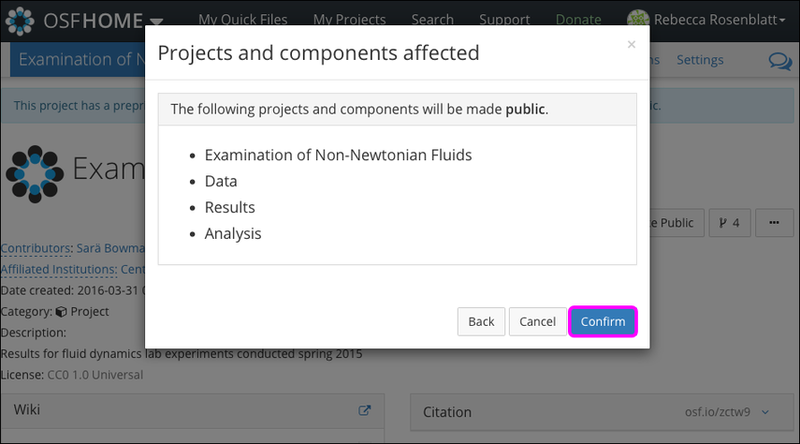 A final modal will appear, asking you to confirm that you want to make your project and selected components (if any) public. Click Back to change which components you want to make public. Click Cancel to keep your project and selected components (if any) private. 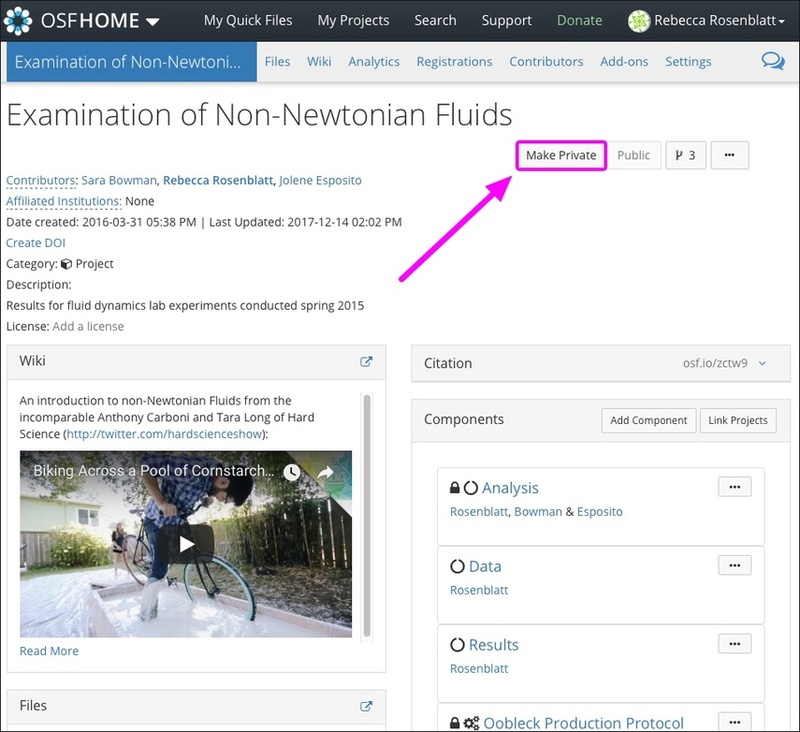 When you're ready to make your project and selected components (if any) public, click Confirm. Your project and selected components (if any) will be made public. To make your project and/or component(s) private, click the Make Private toggle button in the top right of the "Project Overview" or "Component Overview" page. A modal will appear with information on what will happen when you make your project and/or components private. Click Continue. 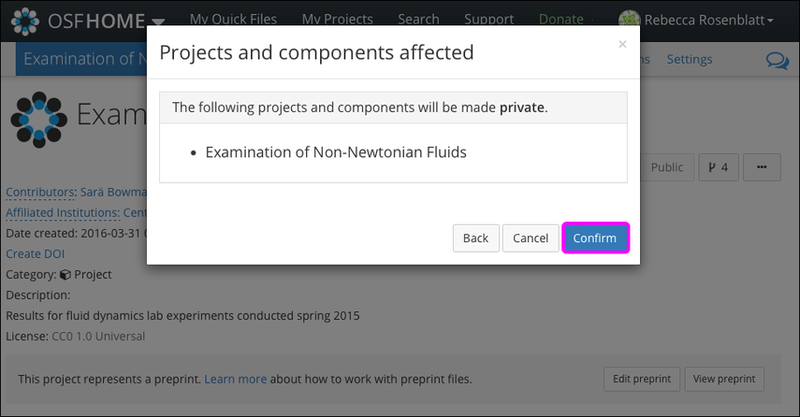 If you don't have components within your project, your project will be made private after clicking Continue. If you have components, a second modal will appear from which you can select which components (if any) you want to make private. If you're not an admin on the components, you will not be able to select components from this modal. A final modal will appear, asking you to confirm that you want to make your project and selected components (if any) private. Click Back to change which components you want to make private. Click Cancel to keep your project and selected components (if any) public. When you're ready to make your project and selected components (if any) private, click Confirm. Your project and selected components (if any) will be made private.